Linda Vernon is a humor writer who lives in the Bay Area with her husband and her Yorkshire terrier, Cha, who she plans to hire out as a toupee if the economy takes a turn for the worse. In her spare time, Linda enjoys writing paragraphs about herself in third person (ha ha), and taking dressage lessons on her retired racehorse, Sedentariat. 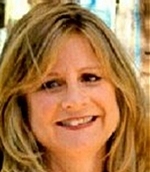 Linda Vernon’s writing has appeared in various newspapers around California including The San Jose Mercury News, The Oakland Tribune and The San Diego Union Tribune. She is also a past Grand Prize Winner of the infamous Bulwer Lytton Fiction contest (it was a dark and stormy night. . .) where writers vie for the dishonor of writing the worst beginning sentence to an imaginary novel. Growing up during the cold war wasn’t all that bad. That’s because the cold war wasn’t exactly cold and it wasn’t exactly war. The cold war was really more of a squabble between two little-girl super powers arguing over whether Barbie should live in Barbie’s Dream House or on Barbie’s Soviet Union Collective Farm — except that if these two little girls ever got mad enough to start pulling ponytails, mankind would have been wiped off the face of the planet. But while the constant threat of getting blown to smithereens at any given moment wasn’t a pleasant thought, we kids of the 1950’s were pretty much able to shrug it off. After all, we had pop bottle empties to redeem, money to collect, and penny candy purchasing decisions to make! When investing in penny candy, I always made sure I included at least one stick of black licorice. Black licorice came in long, braided sticks. It not only cleansed my pallet for other penny candy flavors, but also, it was a tremendous bargain. A stick of black licorice was about eight inches long, and in the event of a national emergency such as a nuclear attack by the Russians (the only kind of national emergency that existed in the 50’s), a highly-disciplined child might be able to survive a week or more by rationing a single stick of black licorice– providing, of course, the child was safely tucked away in a bomb shelter or, failing that, not quite so safely tucked away in grandpa’s aluminum foil- covered basement. Pixie Sticks were paper straws filled with a sickeningly-sweet, Kool-Aid-like, powdery substance that came in a variety of flavors such as: cherry, lime, orange, grape and lemon. All the flavors tasted the same except that they turned your tongue the color of whatever flavor you thought you were eating. I have no idea what that powdery substance consisted of — but if you were to look at my sorry dental X-rays from that era, it was probably some sort of concoction devised by Russian scientists to penetrate the Colgate Shield. I love your connection of Barbies, candy and the Cold War. Very funny article! Would love to read more of your writing. HI Diane! Thank you so much for your comment. You can read more of my writing at http://www.lindavernonhumor.com. Ah! Thanks so much for coming by Joe! And I’m so glad you got that cholesterol information. After all, you’re never too young to start worrying about your cholesterol! Thanks to modern medicine your generation has all kinds of marvelous new things to worry about not just silly old-fashioned nuclear annihilation. You guys just don’t know how good you’ve got it!